If you love someone and they love chocolate – THIS is the cake to bake for them – Chocolate Heart Cake.So my hubby’s birthday was at the start of the year AND I didn’t make him a birthday cake. While we still had nearly a whole Christmas cake left and we had chocolate, in all it’s delicious forms, everywhere. Hubby wanted a chocolate cake for his birthday, Also I was struggling with the remnants of Christmas past that were, increasingly, threatening to take over every cupboard and side table in the house. Phew I was in danger of being over dramatic there? 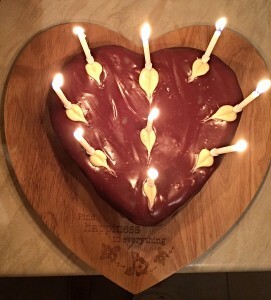 3 teenagers and hubby had made significant inroads, on the chocolate abundance. Time to bake cake. Chocolate cake! It was late. Delayed. Belated. Not on time. There was no getting away from it. As soon as possible I needed to pull out all the stops and come up with an I Love You and I’m sorry it’s late, birthday cake. 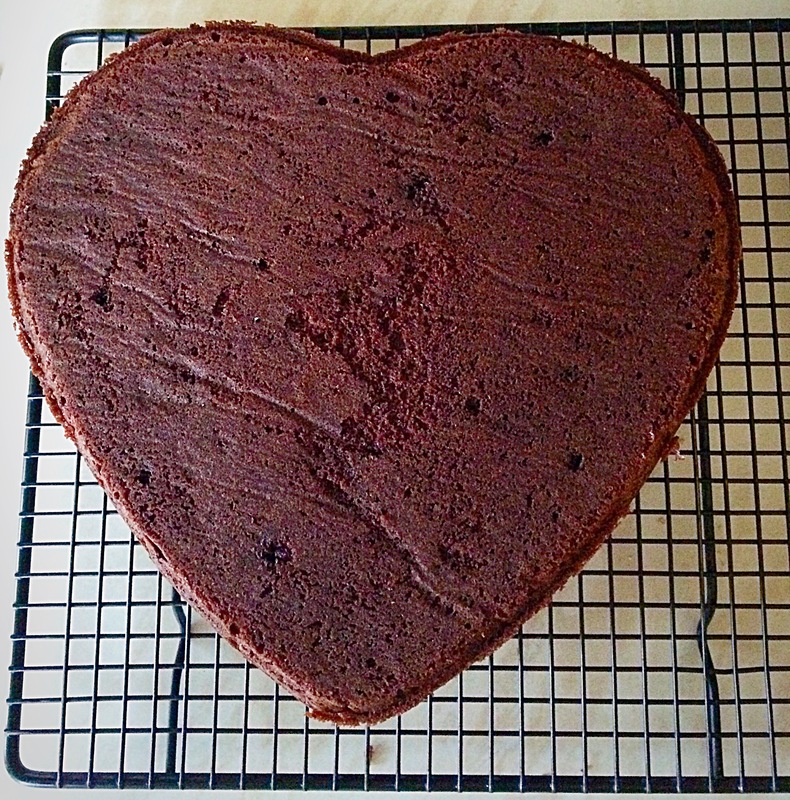 Pretty sure I nailed it with this fudgy, moist, rich, Chocolate Heart Cake. Too near Christmas and this cake would have been too much. 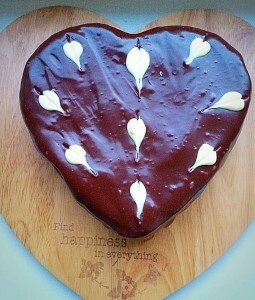 Deeply chocolatey and slathered in a smooth, yet decadent chocolate ganache, accented with little white chocolate hearts. 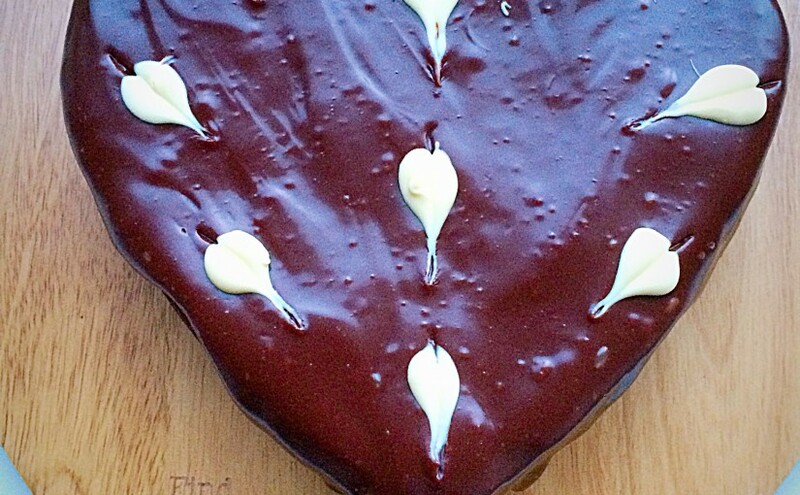 This Chocolate Heart Cake is perfect for all true chocolate lovers. 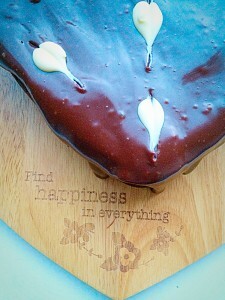 Very fortunately for me, my wonderful husband was happy to wait for his cake. Not only is he the one and only true love of my life, he is the kindest, most patient, loving man I have ever known. Girls don’t settle for second best, or never give proper attention to the man you are with – in the hope that someone better will rock up. When you find someone who loves you, for you, with all their heart, hold on tight and never let go. Back to all matters cake. 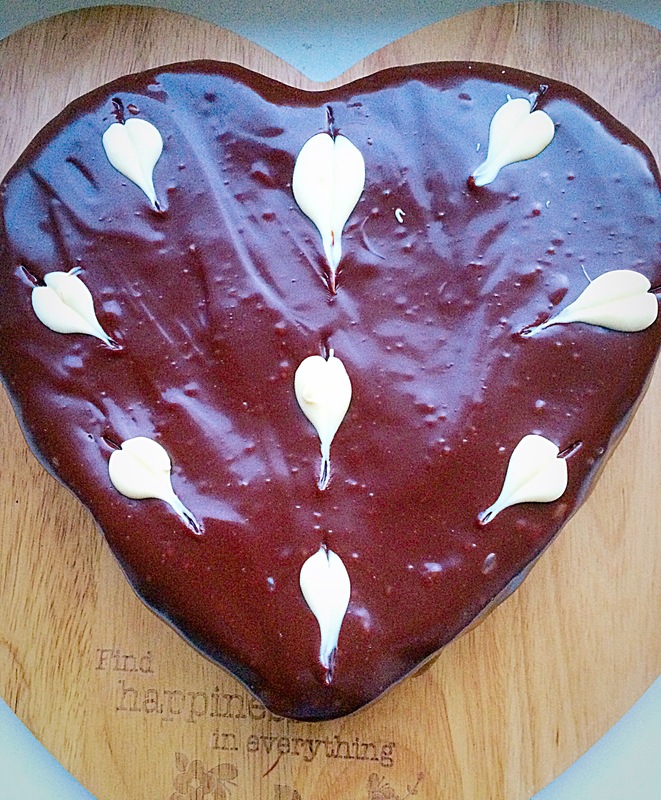 I was going to wait until Valentine’s Day to post this recipe, then I remembered my heart tin, which I bought very cheaply, in the January sales last year. 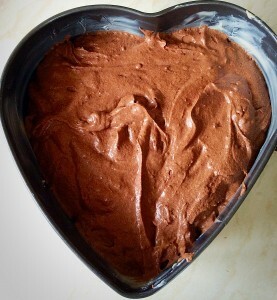 So if you like this cake, want to make it and see a heart tin in the sales, grab that bargain! First of all grease the tin and line with baking parchment. In a large bowl whisk together the butter and sugar until pale and fluffy. Crack the eggs into a jug, gently whisk to break up. Add the sour cream and vanilla extract to the eggs and stir to combine – wet ingredients. 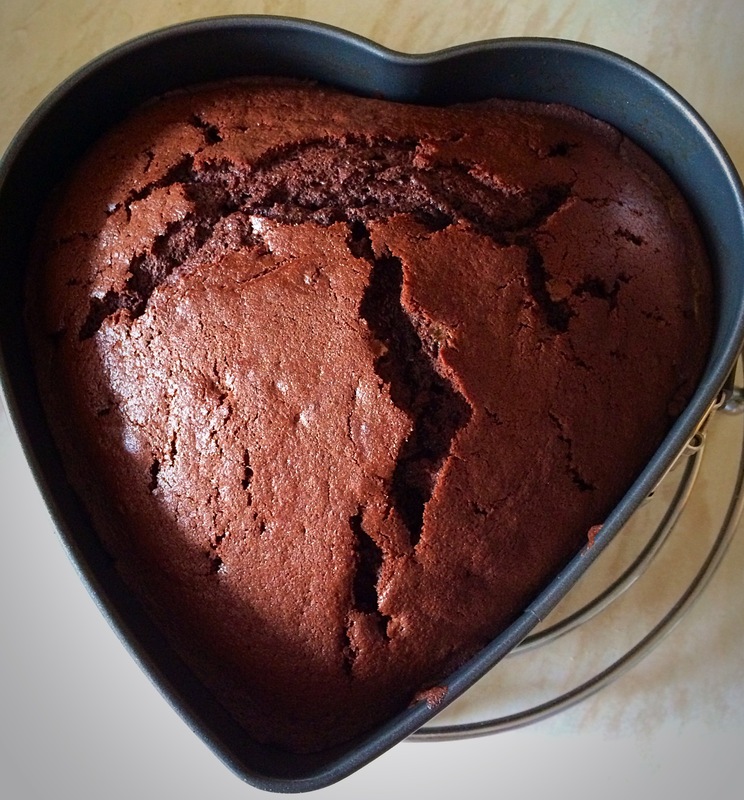 Weigh the flour, cocoa powder, baking powder and salt into a sieve – dry ingredients. Sift one third of the dry ingredients into the creamed sugar and butter. Add half of the wet mixture to the bowl. Mix gently until combined. Repeat the addition of dry and wet ingredients. Mix until combined and then slowly mix in the last of the dry ingredients. Spoon the cake batter into the tin and smooth the surface. Place the cake into the oven and bake for approximately an hour. The cake is baked when it springs back from a light touch. 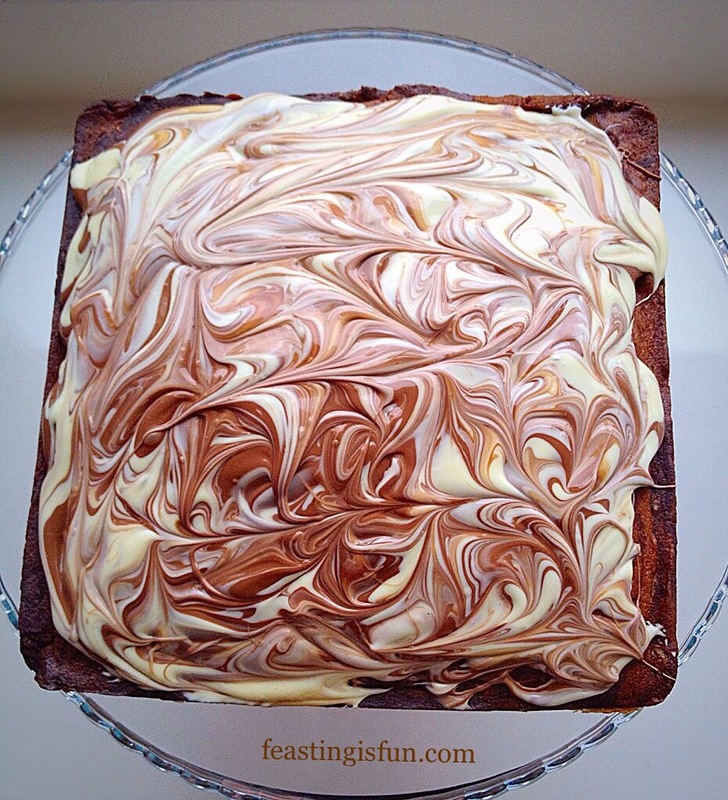 Don’t worry if there is a slight jiggle to the cake, as long as it springs back when pressed. 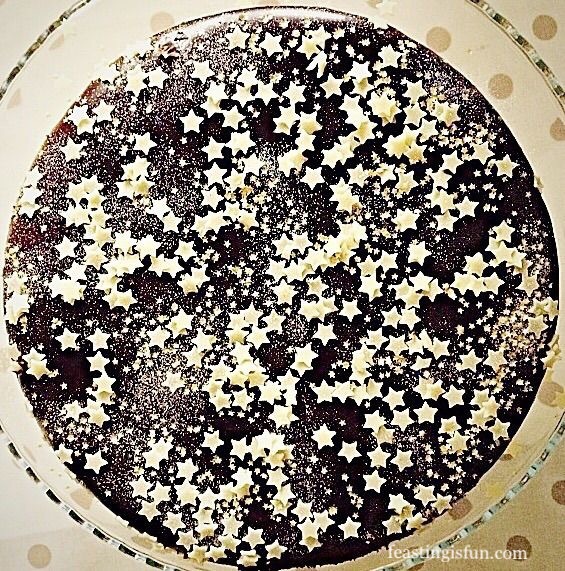 Leave the cake to cool for 30 minutes in the tin. 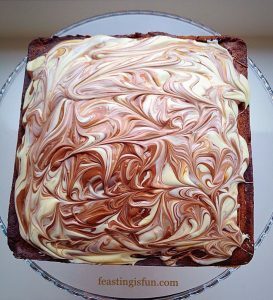 Turn the cakeout of the tin and place bottom side up on a cooling rack.Take care when turning this cake out, as it is very moist, with an almost ‘brownie like’ texture. 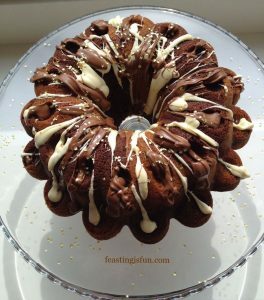 Place the double cream, milk and dark chocolate into a heat proof bowl set over a double boiler see here for detailed photos. 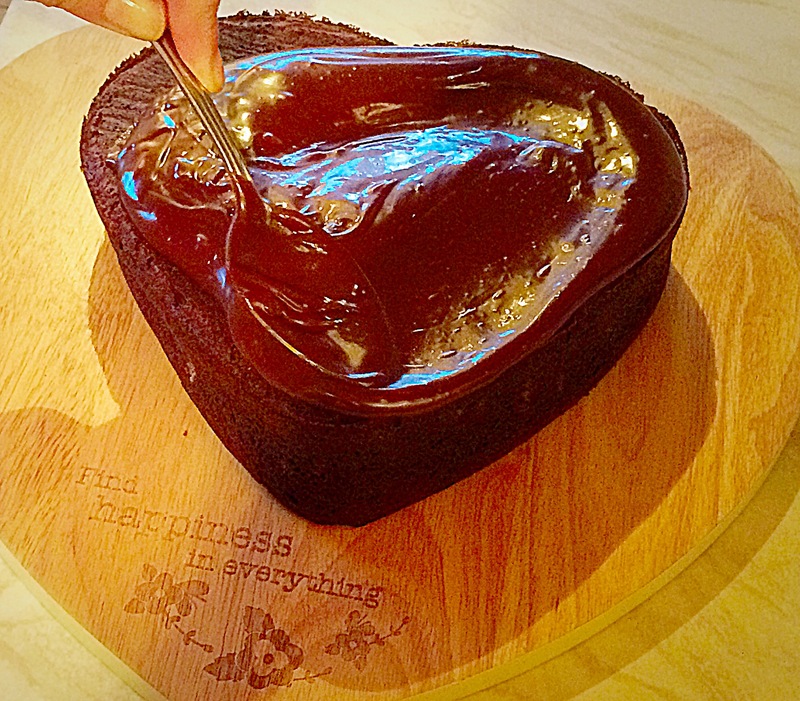 Stir constantly, removing the bowl from the heat when the chocolate is two thirds melted. Keep stirring until all the chocolate is melted into the cream. Set aside until slightly cooled and thickened. Place the Chocolate Heart Cake onto a board or cake stand. 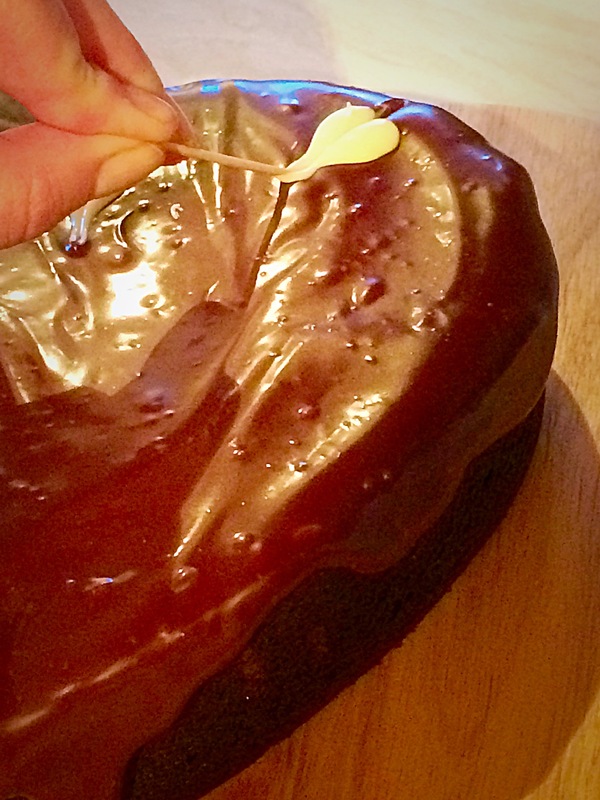 Pour the slightly cooled and thickened chocolate ganache on to the cake. Smooth the ganache over the cake, using a spoon or palette knife, allowing it trust cover the sides. I used the back of a spoon, however, a palette knife would have given a smoother finish. Note to self! 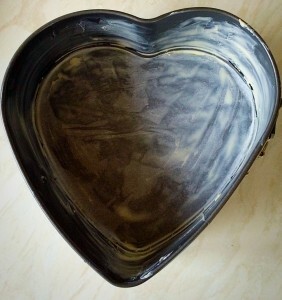 Melt the white chocolate, in a small heatproof bowl, in the microwave, set to medium. Zap in 20 second bursts, stirring after each one, until the chocolate is two thirds melted. Remove from the microwave and continuously stir until the chocolate is melted and smooth. 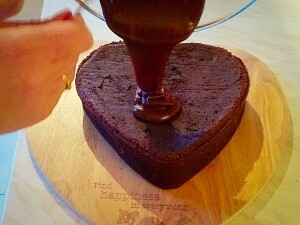 Starting at the centre of the heart dip, drip, using a teaspoon, a small circle of white chocolate onto the cake. Approx. 1cm diameter. Using a cocktail stick and starting just above the circle, drag the stick through the white chocolate to create a wispy heart accent. Creating the wispy heart decoration. Add as many heart accents as you like. The overall cake will look better if decorated in a symmetrical pattern. Move the cake to a cool place to set. During warmer months refrigerate. My husband was thrilled with his birthday cake. Also it not only looked fantastic, but tasted deeply chocolatey too! Do you enjoy baking for loved ones and if so what do you like to bake?